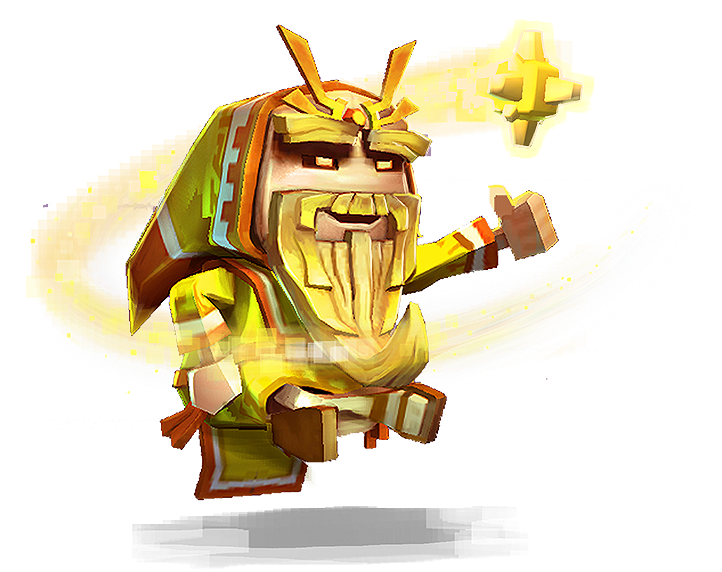 Note: To keep the forces of evil off his trail, Zen will only be available in the Heroic Portal this weekend (6/9-6/13). He'll be back at some point in the future though! Background: For decades, Zen has lead a peaceful life, watching the world from his home high up in the mountains and sharing his powerful light knowledge with the brave few who sought him out. But the growing Darkness caused him to take action and descend into the fray, bringing his powerful light healing powers into the legendary battle against the Boss of Darkness! As with all the Heroes that fought on that epic he was locked away in the portal for what felt like an eternity. Whilst floating between dimensions, he had a vision of the Boss of Darkness' grand plan and has been working tirelessly to escape and warn the Heroes of the coming evil! Most Disappointed In: Pontifex. Why? : Let’s be honest he isn’t really much better than the Lich. Element: Light: +30% bonus against DARK enemies. Fast: Attacks before other characters. Flying: Takes less damage from Melee attacks. Pop and Cover: Basic Ranged Spirit attack that adds an Aegis Shield to Zen. Enlightenment: Heal an ally and grants them one turn of Haste and additional Speed. Light Heart: Increase Health by 15% for all Light allies. Immunize: Each ally healed will gain Impervious (Cannot be Poisoned, Burned, Frozen, Chilled, Shocked, nor Diseased) for two turns. Meditation: Heal all allies, ad make them immune to Silence for 2 turns. Light Heart II: Increase Health by 25% for all Light allies. 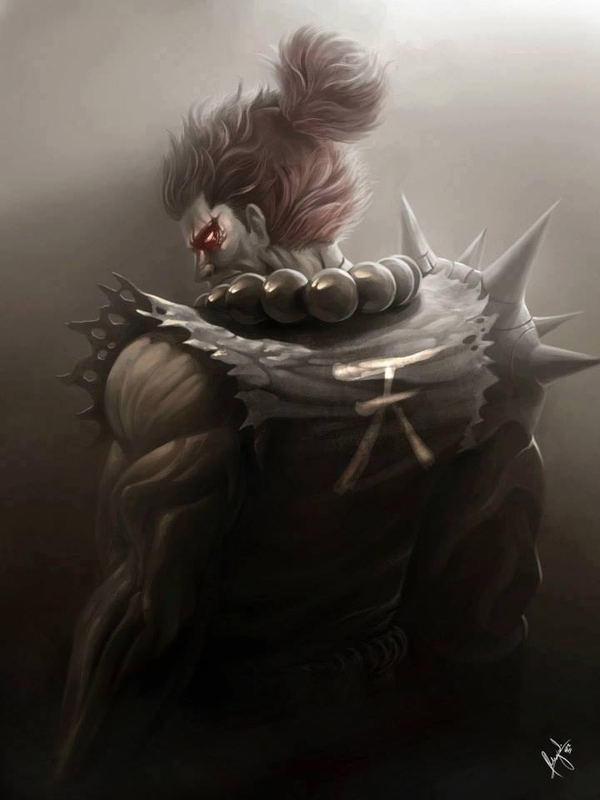 Beloved: When this hero is killed, all allies will attack the killer. Safe Haven: Heal and remove all debuffs from ally and give them Invincibility for one turn. Oh hey hes that guy on that thing Which I cant remember. I also feel like he is the exact same reason kai was created. To counter a whole meta, let me guess he has tank like stats. Why not calling him Zynga? Nice healer however. ...let me guess he has tank like stats. Health-wise, yes: At level 61, 3* FA Zen has 5100 health (with his light ally boost), compared to 5400+ for 4* FA Kai... so basically the same health. However, Zen's Defense is only 1042, compared to Kai's (excessive) 1632, so Zen will be easier to damage. On the other hand, Zen's ability to Aegis Shield himself on basic attack (the only attack he seems to have), probably makes him even more survivable in the long run. Now let's play some PVP and figure out how it works in practice! Considering he looks like a god, at least it's nice to know they have given up pretending new heros are balanced. Power creep for the win. The power creep is real. Funny how a lot of the new heroes are somewhat usable at 3*. It's like the developers not so subtle way of acknowledging that most people won't get them further than 3*. Solid tower fodder. Against a team with no fast heroes, he's guaranteed to eat one hit! That's what new heroes are released for now right? That's what my Corbressa and aether twins are for too. Love soaking hits so my good characters can actually do their jobs. Nonesense. He should take 2 hits too (if you put up shield first turn). I'm not sure what kind of teams you go up against, but when I see 3 star heroes I happily accept a faceroll victory. 3 star kai/3 star furnace/3 star zomm. They are getting train wrecked by 6 star heroes. But in all truth. He's kind of a cool hero and will mess up the meta quite a bit. Also, I like the design. Though maybe he should be a dwarf? 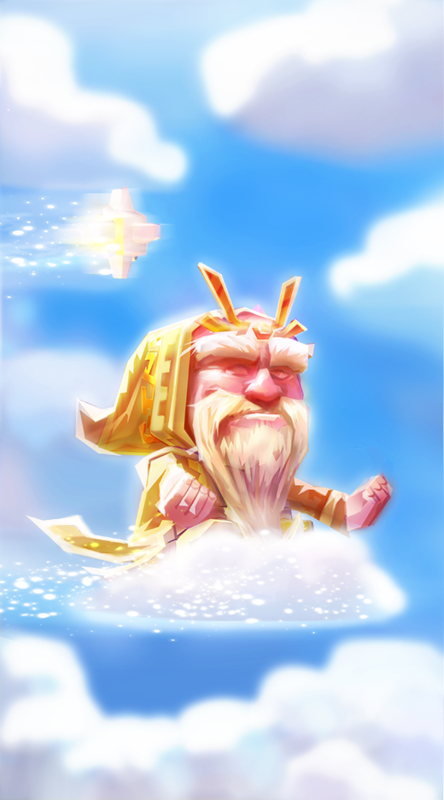 Always hoping they'd add more dwarf lore... then again, if he were a dwarf he'd probably be able to heal construct and that'd be ridiculous. Assuming you can get him past 3* I'm sure, but time will only tell. I'm 63, so I don't face the biggest whales. But I do fight a lot of all 6-star teams. I find 3* kai does his job for me (on offense), which is survive the first fast hit and then dampen everyone's AoE. The same goes with this dude. His real job seems to be to haste/+speed a single disabler. He should do that job fine. So based on the dungeons the Boss of Darkness' new plan is... Dark Bovus??? Managed to get him to 5 stars with some lucky heroic pulls. Let's hope he turns out to be decent! Wait...does this mean the start of a zen Bovus meta? Current Level: 70! King of the hill! This is all intentional. They need to come out with "must have" heroes that function well at 3 and 4 stars so people will be inclined to spend money to get them. I guess it also helps with the issue of not being able to star the legacy heroes -- if they release enough new heroes that are OP, then not being able to 6* the older heroes isn't as big of an issue. 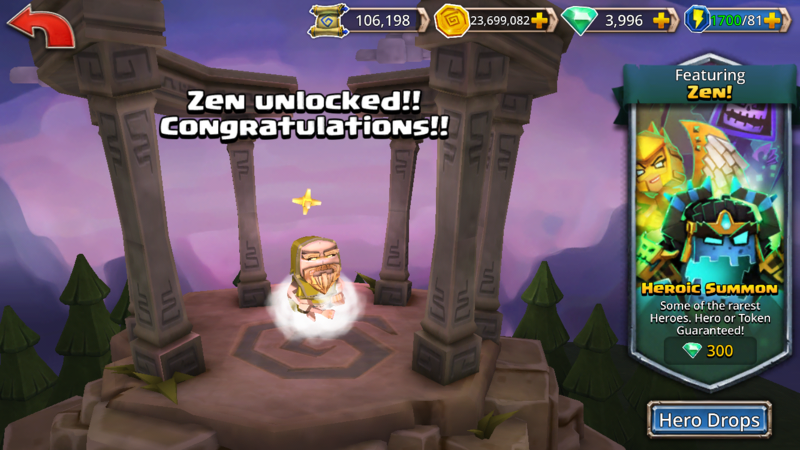 Hi @Joel @Joveth is Zen staying in the Heroic portal after the event? I have noticed that in round 1 in a PVP battle Zen will use a basic attack instead of his first special. I'm assuming this is a bug? Might be tied to it being a healing spell and having no injured party members? Kinda like how Emily/Augustus only uses their heals if an ally is injured? FYI, Zen is a PvP game changer. He's not like a terribly OP hero, but let him alone too long with the right team and things get mean. He's most impressive to be used on offense. @GioUnit You shouldn't underestimate the power of Zen.